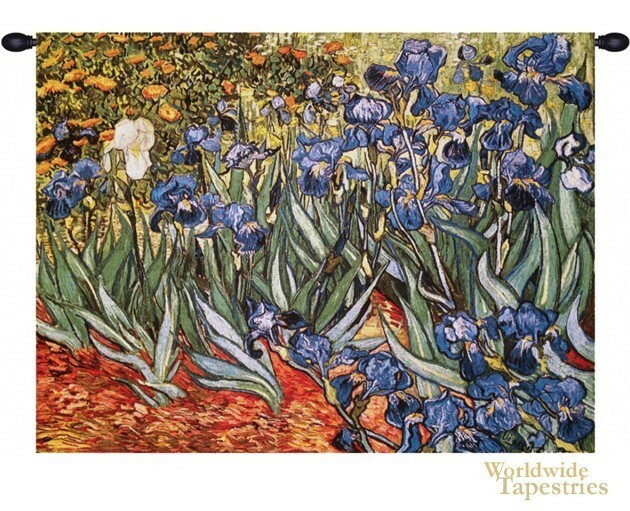 This Irises I - Van Gogh jacquard wall tapestry is based on the famous painting by Vincent Van Gogh from 1889. The original painting was completed by Van Gogh in the Saint Paul-de-Mausole asylum in Saint-Remy inspired by the time in the gardens. It shows irises in garden setting and was submitted by his brother Theo who saw the value of this work, to the Salon des Independents in September 1889, saying "It strikes the eye from afar. It is a beautiful study full of air and life. "The original was purchased by The Getty Center in 1987 for $54 million in 1987. This fine art tapestry is backed with a lining and a tunnel for easy hanging. Note: tapestry rods and tassels, where pictured, are not included in the price. Dimensions: W 48" x H 37"